Today I want to share with you an all-natural product that you can make easily at home in order to build your DIY medicine chest. 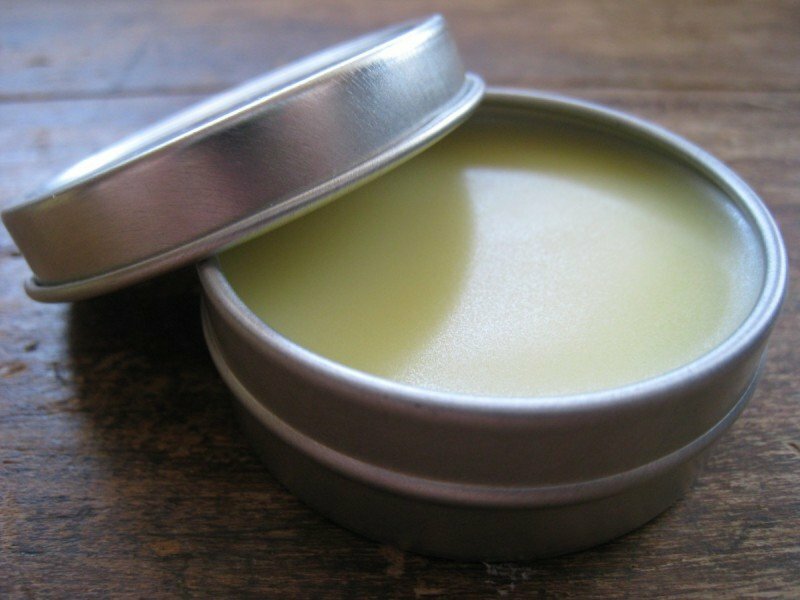 This homemade antiseptic ointment is packed full with germ-killing properties that will help treat everyday minor cuts, scraps, and abrasions. You can use this ointment just as you would a tube of that pricey commercially-prepared stuff. Best part of this is…you control the ingredients! For recipes such as these, I only recommend the use of the organic essential oils from Mountain Rose Herbs. Over very low heat, in a small pot or double boiler, melt oils and beeswax. Remove from heat and add vitamin E oil and essential oils. Stir until well combined. 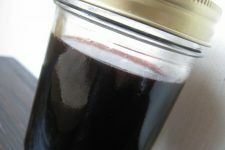 Pour mixture into small sterilized jars (or a mason jar). Allow to cool on counter. Store in a cool, dark place. Use as needed on wounds. Will keep for approximately 5 years. -For those who do not like the smell of lavender…you may substitute chamomile essential oils for lavender and fir essential oils for lemon. -I purchase the ingredients used in this recipe from a local health food store. Otherwise, I like to purchase from Mountain Rose Herbs. What’s your favorite ointment to use? I love this idea! But I am scared about sterilizing the containers. What is the best way to go about this? Don’t be affraid Carrie:) Just boil them for about 10 minutes or so. The essential oils are antiseptic so the product will be okay. I’ve never had a problem with it going bad using this method. Hi Andrea, Can you please tell me if you can use this on pets?? Thank you 🙂 have a blessed day. I’m not sure about most, but I do know that tea tree oil can be fatally toxic for cats. I would search online, look up each individual ingredient with regard to your specific pet (breed, if you know it) and perhaps consult a vet. You could try oregano oil, garlic oil, instead of tea tree oil. I found that calendula oil is very good for infections as strong as staph and strep like impetigo. For instance you can make a pretty good antibiotic lip balm with calendula oil, tea tree oil and other skin conditioning antiseptic oils. Very Similar to a homeopathic Carmex. Homeopathic medicines work as well for a lot of things that prescription drugs would and cost a fraction of the price without side effects. Even simple honey and cinnamon can cure a lot of ailments. Dont copy my recipe and market it. Mine is exact anyways but its like i said Calendula oil, Tea trea oil and Vitamin E.
This sounds like naturopathy, not homeopathy. homeopathic medicines are made by diluting toxins to undetectable levels with the idea that like treats like. They don’t use essential oils in the way this is doing. You should not use essential oils of any kind on cats. Use hydrosols instead. Run it through a cycle in your dishwasher. Hi. After the dishwasher, I put my jars in the over about 200 degrees and take them out as I fill them. Use only canning jars…..if you are afraid of the sterilizing part. Caning jars come in small, small sizes. Try boiling containers in hot boiling water for sterilization purposes. By he way, ANYONE FOR SOME JELLO GELATIN? Looks good enough to eat. SOOOOOOO lets eat. LOL. Seriously, boiling hot water should sterilize the containers or maybe even rubbing alcohol or maybe hand sanitizer. I made mine with peppermint, tea tree, and lavender. I did not use vitamin E. Is that used as a preservative or for skin softening? vitamin e is a skin healing vitamin. However, it is most often made from soybean oil, so I wouldn’t use it unless I know what it is made from (the source ingredient). Both:) It’s fine that you didn’t include it. The essential oils will help with preservation. Natural un-pasteurized HONEY is an amazing healing product as well…add a tsp or more to your mixture. Honey: buy directly from the beekeeper that is also called raw, which means it is unfiltered and unheated ; therefore still contains all the natural ingredients from the hive. If you can find it propolis would be the best ingredient as an all natural antibiotic which bees use to seal their hives with to make them disease free. Dont heat propolis or it will loose its propertys to heal. I used a recipe very similar to this that included raw honey. It is wonderful when it works, but the honey is known to settle out. The trick is to keep mixing vigorously until just before pouring and pour quickly (just above solidifying temps). If your large batch solidifies on you – just reheat, whip it again and pour. Some of my containers had settled honey at the bottom and it is an absolute mess. (I didn’t re-whip it on one of my pours.) I’ve used this salve on my lips and cuticles all winter. When done right, it is wonderful…when you screw up, it still works but is very, very sticky. Next time, I will probably axe the honey. It is just too much of a pain. You could use a little but of emulsifying wax in your mixture and that should solve your separation problem. I tried the recipe and it’s terrific. I’m keen to add some bee pollen to my next batch. Pollen is quite granulated; do you have any advice on how to add this without it having a sandy texture? Could I maybe infuse the oil first then strain it? mason jars will fit on a standard blender base. use one large enough to fit all your ingredients and have a little room left over for the moving action. mix on the base, tip into cold water bath, then back on the base for another blend. Repeat till it starts to firm up a little. Then you just give it a shake and back into the water bath. Once it’s firm enough to start sticking to the blender blades take the base off and just replace with a standard mason jar lid. At that point give the jar a good thump on the table to slide the contents down the insides and consider sticking a popsicle stick in the jar for scooping purposes. I use the same method when I make garlic butter from oven roasted garlic cloves. Bacteria can not grow where honey is! Remember if you heat raw honey the enzymes are altered. Thanks. I just bought some raw honey and have been using it more for food, but wanting to use it in some natural products too. raw organic manuka honey is another excellent honey to use. coconut oil also has anti-inflammatory properties – so I would use that one. I take it internally and it makes healing really speedy. Where do you purchase your Vitamin E from? It should be in the vitamin section of any grocery store. Ask the pharmacist:) They’ll be able to help you find it. I have a question about the Vitamin E Oil… I have a liquid, is that the same or do I need to find an oil? I looked for Vit. E at the grocery stores, but all of the ones I found had soybean oil or corn oil, or a list of other ingredients. Double check before you buy it. Mountain Rose Herbs is the only place I get mine from! Organic and GMO-free for sure. Oh, I like the look of this! Will have to make some ASAP. Isn’t fun how easy these things are? I just love it! I have beeswax pastilles so how many teaspoons or tablespoons would I use for this recipe? I always do this by weight, but I would estimate 2-3 tablespoons? Thanks. I recently made lotion w/my pastilles and I think I used that amount. I’m glad to find your homemade lotion b/c I think I’ll like it better than the one I made. If someone is allergic ro beeswax is there something else that can be used? Thanks. I would just leave it out, and use coconut oil. the product will be softer but will be useable. We’re commercial beekeepers. Being allergic to beeswax has nothing to do with being allergic to bees. A lot of people assume this (like being allergic to dog dander makers you allergic to dogs). When one is allergic to bees, they’re actually allergic to the proteins in the venom in the stinger. None of that is in the honey or beeswax. If one is allergic to honey or beeswax, it’s because one is allergic to the plant pollen it contains. Since bees fly up to three miles in search of nectar and pollen and we can’t control where they go, there’s no way to know if the beeswax or honey contains the pollen one is allergic to, unless one already knows the specific plant and is certain it doesn’t grow in the region the honey was produced. I dare to say that might not true…. I’m only allergic to a few things in this world and they are: Honey, Bee Pollen, Bee’s Wax, Bee Stings, and Jellyfish stings. Honey and any bee product makes my throat itchy or devlope a rash…..and being stung by a bee or jellyfish can send me over the edge. Unless I am completly weird I would think most people allergic to bees would also be allergic to the same things. That actually makes sense, but I am not sure. Anytime I have tried to use anything that has beeswax in it, I develop a rash or have an allergic reaction, yet honey….if it’s mixed in to things, and I don’t take it straight, I am fine with. If I take honey straight, I have an issue. I am quite allergic to bees, or the last time I was stung I was. I tried that burts bees stuff and it made my lips blister and everything, it was crazy. I stopped using it, and that went away. I am allergic to pollen as well, but like I said, I can handle honey if it’s mixed in to things, and every time I try to use beeswax I haven’t been able to handle it. I still continue to try stuff with it in it, hoping that my body will just adjust, but I would hate to make so much of it, and it go to waste. That is interesting because I am allergic to bee/wasp stings but I can eat honey (fresh from hive and store bought) and use beeswax products with no issues. I just want to say that Burt’s Bees is no longer made by Burt. He sold out and it’s now a commercial product – so they most likely have changed the ingredient list that made the original product. At any rate, it may not be the wax, it may be a chemical that is used. Yes, I hate it when companies do that. They dont realize it could have an impact on persons body changing ingredients. And a person eouldnt realize whats changed. I also believe generic medications are a lesser strength than brandname. They use different ingredients so they dont redpind as well. They wonder why antibiotoics dont work etc. Emsulfying wax could be used instead. You need the wax to help solidify the salve. Ok, this is wicked cool. Adding this to my list of things to do! Again, I am printing this. Do you realize you’re making me kill tons of trees over here? Another one bites the dust. What a great idea…. Will share it on our facebook page! This makes an excellent diaper rash ointment as well, very similar to one I am using for my little one now! Organic Virgin Coconut Oil would be great in this for a diaper rash ointment. We had a child with persistent yeast issues and the coconut oil helped more than any prescription. Hi and Happy new year to you and your family! What a great idea, thank you for sharing this! It’s on my to do list! Great question Becca:) There is an intital start up cost (i.e. essential oils). But if you have olive or coconut oil for cooking, use that. These are the essential oils I have in my cabinet always. They are the cheaper ones and when you consider we are only using drops it ends up costing pennies. You really begin to see the savings as you make the switch over to homemade. You’ll notice a lot of the same sustainable ingredients are used in many different ways. I use witch hazel and eucyliptus oil on a cotton pad to stop sting of bug bites. stops the itch right away. I made four 8 oz tins of this and btw it is fantastic, works much better than Neosporin. I also priced it, adding the cost of all ingredients and dividing by 4 and it was about $8.50 each. 1 oz of Neosporin at walgreens is $10.49. so, 8 oz of Neosporin would be about $80 compared to $8.50 of a natural organic ointment that works better. I should mention that I doubled the recipe to make four 8 oz tins. i make this and i add herbs of calendula, comfrey, very good stuff, great for baby bottoms. Those are very good add-ins Dawn! I love making calendula salve when my flowers are in bloom! I also like to use lemon balm infused oil…excellent for the skin. How do you do that? how do you add the herbs and how do you make herb infused oils? Do you boil them and mix the “tea” with the oil?? Infuse the oil with the herbs first. You can either gently warm them in a double boiler do not boil or let them get to hot to burn the herbs, let cool. I actually do this – warm up let cool – 2- 3 times to get the most from the herbs, Or put them in a jar and place in a warm place and shake every day for 2-3 weeks. I use the latter way unless I’m in a hurry. Just pinned this. Recipe looks great. I have to stock up on the beeswax and then I am set to go! Is there a substitute for beeswax? I am a vegan and do not use beeswax. Honey Bees are vegetarians unlike Yellow Jackets which are carnivors. Honey Bees only consume plant materials. Eva, that is not the issue. Vegans do not consume honey or use any bee products like beeswax because they are sentinel beings and the majority of bee products are the result a cruel methods that are harmful to the bees. It is a personal choice. Emulsyfing wax will work as well. 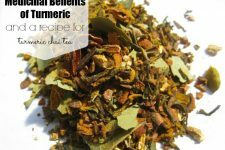 mountainroseherbs.com is a great source for all of the ingredients in this formula. Thanks for sharing this recipe! I make a lot of homemade health and beauty products so this will be a wonderful addition! Sounds good; I’m going to try it out. I don’t think we will be able to use that much ointment before it goes bad, but maybe it will keep in the refrigerator longer or I’ll try cutting the recipe down. What a GREAT post! I love using my essential oils but usually just apply them with a carrier. I’ll have to try this since we have some beeswax that we got from our local beekeeper. 🙂 And thanks for sharing with Wildcrafting Wednesday! I just pinned this – can’t wait to make it! I have a baby with a rash on his cheek (that I think is due to teething) and the Dr. wants me to use steroid cream to cure the rash and antibiotic cream to ward off infection. I think this balm will do both without the possible side effects! I’ve been using olive oil but I think he’s sensitive to it so I was glad to see substitutes that we already have on hand. I can’t wait to check out the rest of your site! Yay! I have all of the ingredients except the lemon oil. Definitely going to try it. I think I did something wrong because mine came out way too hard. I have to dig into it with my fingernail & then warm the little chunk I dug out in my hand before I can use it. I am going to re-melt the whole thing & add more coconut oil and probably a bit more of the EOs to offset what I’ll lose heating it up again. That said – it works wonderfully! My daughter got a *huge* scrape on her face the other day when she fell face-first on hard-packed snow while sledding. We’ve been applying this several times a day and the scrape is healing up beautifully. mine was too hard also and I melted it and added more olive oil. not too hard not too soft. A couple of years too late, but adding more coconut oil may make it harder. If you live in cooler temperatures, your ointment will stay firmer with more coconut oil. Even I, living in Texas, have a jar of coconut oil sitting in my bathroom that never melts without work. So, adding more coconut oil will not necessarily make it easier to spread without melting. Hello, I live in the Netherlands and really like to try this salve on my son who has eczema. I have bought all the ingredients here online. Unfortunately i have bought citronella oil instead of Lemon oil. Is that a problem? You do not want to use citronella oil, because it is a harsh essential oil for your skin. Sorry! I make alot of lotions and cremes, soaps, etc. so I have researched alot of essential oils. I have a question, where do you get those little containers? And how big are they? I order them from an online supply store called Specialty Bottle. They are the one ounce tins. Check out the wedding section of craft stores – they usually have packages of small containers for homemade wedding favours. I am going to have to try this. I recently developed an allergy to Neosporin. I will try this on my grandson…he is slobbering so much….under his chin he is developing a rash from the wetness and hopefully this will not only help it to heal but form a moisture barrier as well! I use lanolin with a bit of carrier oil (olive, etc) added in place of Aquaphor (Lansinoh + tiny bit of olive oil to make it easier to spread). Do you have any insight on which essential oils are safe during pregnancy? I’ve heard lemon and tea tree oil probably are safe, but any others that you know of? Sorry to drag on, but my main question is, would the eucalyptus oil work as well with the lemon grass oil? Lemongrass EO can be a bit harsh for skin that is healing. I only use it in deodorants and insect repellents. I use eucalyptus EO for congestion salves, but not skin healing or soothing salves. It is best to use skin soothing or healing EOs with a salve like this or just skip the EOs. I know you are not supposed to use Lavender essential oil while pregnant. I am allergic to tea tree oil (and the entire latex family). Could you recommend another oil that has the same property? Would oregano oil do the trick? Thanks for the recipe, I hope I can modify it! Oregano is an extreme skin irritant, so that would not be a good choice! I’ll let a more experienced person advise you on a good substitution, but wanted to jump in and let you know that this would make irritated skin feel even worse. You can just skip the tea tree EO. Maggie is correct! Oregano EO is a skin irritant. You want to use skin soothing and healing EOs in a salve like this or simply skip the EOs. I just made a batch of this and love it! I’ve been using Burt’s Bees Res-Q ointment for years, and this is exactly like it. Except for the cost: my batch must have cost less than $2 to make! Thank you. Your entire site is so much fun! Thanks for sharing this recipe. Can you tell me how long your ointment will keep for? I’d love to make some, but I may not use it all before it goes bad. It might be cheaper to dry herbs and infuse them in olive or coconut oil and add beeswax. Saves buying essential oils. I use comfrey, plantain, yarrow, and st. john’s wort infused into olive oil and add beeswax to make a salve. I also add tea tree oil, very cheap at WalMart. Lasts a long time, I’ve used some more than 4 yrs. old. Works on burns and animals also. Hmmm, while this may be cheaper, I need to respectfully disagree with your recommendation. While the resulting oil would smell like an EO, please keep in mind the high quality EOs are distilled very carefully and have chemical healing and medicinal properties that go far beyond the smell. This method would lose all of those benefits, and remember this salve is for home health care, not just making your skin smell nice (not that I’m against salves to make my skin smell nice, mind you!). The healthful properties of the herbs are infused into the oil. 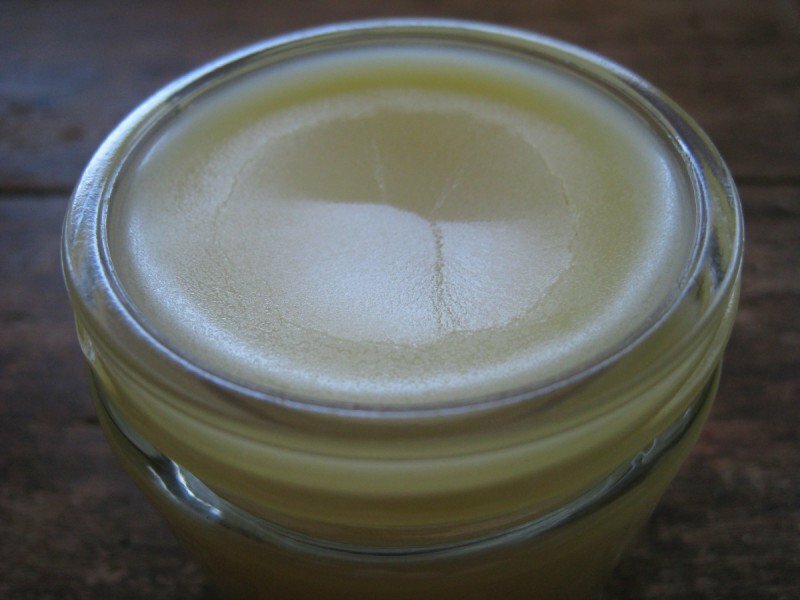 The resulting salve is just as healing and soothing to irritated skin (cuts, scrapes, etc). In fact, using St. John’s Wort infused oil in my skin healing salves reduces pain very quickly! St. John’s Wort doesn’t have an essential oil. Neither do comfrey or plantain. All three have very beneficial properties. You can find many more aromatherapy websites that will say the same sort of thing. The infused oil is not completely useless, but pales in comparison to the power of real EO. Hypericum (which is not an essential oil) on its own is a pain reliever, so it doesn’t need any EO to make it so, I’m not sure how that relates to a discussion about using dried herbs versus essential oils. I infuse herbs into my oils to make all of my salves and lotions. That way I get the best healing properties of both worlds. Hi, I’m not sure about all animals, but I do know that tea tree oil is fatally toxic for cats. Hi, Andrea! Thanks for sharing this, can’t wait to try it. About how much ointment would you say this batch makes? About a cup (for the evoo) and a quarter (for the rest mixed together) would be my guess. Can you use lemongrass instead of lemon? Lavender essential oils have a precaution for pregnant women and babies … does that change when used with these other ingredients? I made this today and am very excited about it! It is so beautiful. Two questions since I’m just getting into my DIY stuff and stocking up on supplies. 1. For essential Oils, I talked to the guy at the Herbalist where I bought mine. They aren’t 100% pure essential oil, he said those would run more like $30-$50 per ounce or 1/2 ounce. The ones I bought still have the benefitial qualities of oil right? I mean I know this is a reputable place here in Seattle, i didnt cheap out but just wanted another opinion on that. 2. Any reason why i shouldn’t use this on my lips? Tea Tree oil would be ok on lips? Hi, Barb. Unfortunately, you really do need to get the good stuff. It’s a significant initial investment but since you only use a few drops at a time, they do last a very long time. 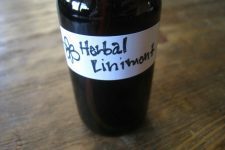 A great source for oils is http://www.mountainroseherbs.com. They also have tins, beeswax, vitamin e oil, and tea that you can sip while your salve cools down! Hello. I had great fun mixing this salve up! Unfortunately, I ran out of tea tree oil and could only add half. I subbed roman chamomile for the other 1/4 teaspoon, and the resulting salve still smells pretty strongly of tea tree. I think I might stick with my substitution in the future. Some other advice – be sure to sterilize all of your equipment, not just the tins (1/4 tsp. measure, chopsticks, tongs to pick the tins out of the hot water if needed, etc). When pouring the salve into the tins, place them on wax paper for easier cleanup. Also, a wise friend of mine suggested that I keep the wax on very low heat, make one tin and let it cool to be sure it’s not too hard, then adjust with more coconut / olive oil if it’s too hard. Question – you say int he recipe that your salve will last 8 months or so, then in the comments that it will last 5 years. That’s a big difference! What do I need to do to make it last the five years – keep the excess in the fridge? Hi Maggie! Salves are best used within the first year, however they will keep for up to 5…especially if high quality ingredients are used. I am really interested in making this. Have you ever made something like this with Jewlweed? I am looking for something to help with the itch and healing for mosquito bites. My kids welt up so badly! I made this recipe tonight and I noticed that my beeswax settled at the bottom. I’m wondering if it’s because it’s fresh wax from my hive rather than the dry blocks of beeswax. any thoughts? This is almost the same recipe I use for deodorant. It works great. Smells good, too! Only difference is I add arrowroot powder (usually 4-5 tbsp/recipe) to add dryness protection. Just wanted to mention to be very careful with the teatree oil if you have dogs or cats. It’s highly toxic to them. Interesting how all these natural items have antibiotic and antibacterial properties. Thanks for all the tips. 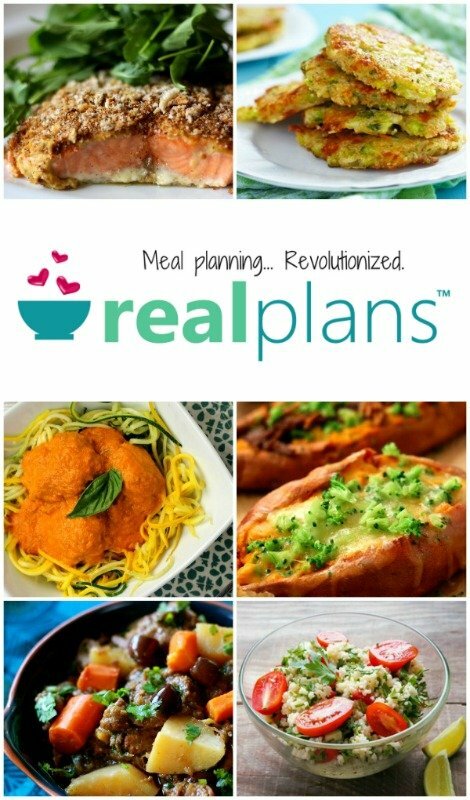 Hi thanks for sharing so many wonderful recipes, tips and more. I made the ointment and thinks I followed the instructions to the “t”, just wondering if the texture of the cream should come out hard. Mine came out very hard I have to scrape it out of the jar. Did I omit something? thanks in advance for your guidance and again thanks for sharing. Easy fix is to melt it in a double boiler over very low heat and add a little more oil. When melted, dip a cold spoon into your mix and let it harden (counter/fridge/freezer). Test the consistency. Add more oil if the salve is still too hard. Add a little beeswax if the salve becomes too soft. Once it is cooling, you can add more EOs if you want because some will have evaporated in the heat. Then, pour the salve back into containers as you did the first time. Thanks for posting. I was told a few years back by my nurse prac not to use neosporin because people frequenly have a reaction to ir. This looks like a great alternative. Is there any alternative to tea tree oil? like maybe oregano oil? I really need to stay away from tea tree. Thanks!! Where do you get the little metal containers at? Thanks! Love it! If you used unwashed bee wax I bet it would be even better as raw honey has tons of antibacterial goodness in it. Just a moment to say thank you for bringing us wonderful information and clear, easy to follow tutorials. You are a blessing. Thank you so much for your encouraging words simplychele:) They mean the world to me! Hi, I am doing this as a demonstration for my class and I was wondering how many little jars this makes approximately? This is a great blog – I’ve learnt heaps here, thanks! I just made this salve with coconut oil, and then realized that someone I planned on giving some to…is allergy to coconut. Apparently I’ll be making another batch with almond oil. How do you think avocado oil would work? Hi. I was wondering if any of you have a recipe for an antiseptic ointment that does not contain lemon oil or lavendar as I am highly allergic to citrus anything and deathly allergic to lavender. Thank you. I had a question…. can you use rosemary EO in this salve? It’s my absolute favorite go to oil (I mean, seriously, how can you beat an anti-viral, anti-fungal, etc.) and I actually think it helped my shingles from spreading when I had them earlier in the year. I can’t keep enough rosemary EO in my house, lol. You might want to know that rosemary essential oil has been shown to increase brain activity, it’s a stimulant. So it’s great to perk you up. Lavender, on the other hand, has been shown to slow down brain activity, it’s a calming agent. It also works to calm the skin which is why you see it used so frequently in skin care. The scientific studies on this refer to the alpha waves and beta waves in the brain (one denotes increased alertness, one denotes increased relaxation) but I can’t recall which is which after learning this many years ago. You might choose Chinese Geranium essential oil instead of lavender for this salve. It is excellent for skincare and will also help healing, plus it smells divine. This link is a very good reference site to find the proper essential oils for you and to be sure you understand the properties (benefits & detriments) of how the EO will work in your particular situation. It’s important to understand especially any contrindication in using EOs as they are extremely strong. Also, don’t increase the amount in a recipe — they are far more powerful than you might imagine having been distilled from dozens, hundreds or even thousands of pounds of plant material in order to extract just one pound of pure essential oil. This stuff is SO GREAT!!! I use it on all of my kids scrapes and it really does help! I made small little cups and gave it out as part of our homemade Christmas presents to friends and family. I’ve used this stuff to help with my psoriasis, and my kids athlete’s foot, and just general dry skin and for chaffing. My family has also had great results from using on eczema, and my sis in law uses it on sores she gets from a medication she takes for Lupus (I think). thanks a million and i do like to read good recipes ..
i know know what a spambot is but I checked it anyway …. I make something similar, however I take the oil and infuse it by heating it to about 100-degrees and adding a handful of calendula petals and allowing it to steep for about 2 weeks, then I continue and make the mixture, straining the petals out first. It has many uses. I read that heating the theraputic essential oils takes away the healing properties. Does anyone know about this? It seems that this would not work as defined if that is the case. I really want to do this, but would like to know more! Yes, heat will distroy the theraputic properties that is why you should add them in at the end as the salve cools. Yes, heat will destroy the theraputic properties of EO’s, that is why you should add them in at the end as the salve cools. Thank you for sharing this recipe and all of the other that you have! I love to do things the natural way if at all possible! I just made this! Love it! Smells nice and I put it on a really bad scratch that had infected …I had been using the store bought polysporin type cream but it wasn’t doing much for it at all…Yesterday, I applied this home made one and I see a marked improvement already today!! I used Coconut carrier oil …The ointment sets up quickly ..and the recipe makes exactly 5 of those small flat tins…I plan to stock both our daughters medicine cabinets lol….BTW, I get all my essential oils, bases, vit E and ingredients from New Directions Aromatics …great prices and a huge variety ! Let me give everyone a little lesson in nursing 101. This is a BAD idea!! Putting any cream like this on a wound is going to actually cause sepsis(blood infection). This is not an antiseptic! Your term is quite ironic. Also none of these items have any antimicrobial effects. These are not antivirals. You cannot get rid of viruses like that! Ever wonder why you can’t treat a cold?! Then lets talk about how you’re going to stick your hands I to a jar multiple times. Cool you’ve just reinfected yourself over and over. And the definition of sterilization is that it will kill endoscopes which means it will kill all microbes. Boiling a jar for ten minutes will not do this! This is a horrible idea and no one should try this. This is a breaking ground for infection!! This is a typical response from someone that knows “nothing” about essential oils and herbs and their amazing healing properties. Most EO’s are anti-bacterial, anti-fungual, anti-microbial, and anti-viral. So please educate yourself in the benefits of herbal medicine before spouting off your nursing 101 “lesson”. As for boiling a jar for 10 minutes not sterilizing a jar – how do you think people that do home canning sterilize their canning implemts. This is great. I’m allergic to the bacitracin in typical antibiotic ointments and finding and ointment that contains tea tree with no bacitratcin has been very difficult. Now I can make my own and control what and how much goes into it. Thanks for the great info. My daughter cannot use neosporin because of the sulfate. Bactracin works ok but a salve with menthol and others worked better on her from a chemical burn. I just finished radiation treatement from breast cancer and am looking for more help with pain and healing for the burn. Have been using aquaphor, Vit e oil, aloe. Would a mix of honey, vit E, and coconut oil help this type of burn? I am an educated nurse thank you. Boiling a can will not kill everything to the point of sterilization. Sterilization is the point of no living things left period. Canning uses high pressures steam for long periods of time and its still an issue. Ever heard of botulism? Ira a bacteria that lives through heating. It’s typical food poisoning. And healing properties? Really? This won’t heal anything. It may be ani-inflammatory and reduce pain but this isn’t going to kill anything. Natural oils have no antimicrobial effects and I’d like to see anything that says what about it is antimicrobial. @ Heather – If you don’t believe in the healing powers of herbs and Essential oils why are you even on these pages. The people that come to these sites are looking for alternatives to “big pharma” and these are viable options, whether you believe in them or not. So please do some research on herbalism and essential oils before trying to convince us (those of us that know that they work) that they have no healing attributes. Open your mind and continue your education. I’m an RN as well. A quick search of pubmed will yield scientific studies which support the use of essential oils medicinally and their antimicrobial properties. Spend 5 minutes to look it up before leaving another ill-informed condescending comment. Tea tree oil has been proven to treat and prevent staph infections including MRSA. Heather, are you suggesting that prescription creams laden with chemicals that are TOXIC, with several adverse side effects would be a better alternative? I am doing this tonight, do you think it might be safe to use with cloth diapers? My 2 year old has had a very persistend diaper rash and want to try this on her. Yes, it should work very well for that purpose. Boiling will not sterilize anything. Do some research. I wouldn’t leave this in the jars for too long as bacteria could grow in this quite easily. when you say Tea tree oil, do you mean tea tree essential oil? Or it’s two different things? I found a recipe for a baby diaper rash cream that called for Neosporin, but I would love to substitute that for this. How do you think this would interact with cloth diapering? About how much does this one recipe make! I am doing gift basket for Christmas, I know it is earlier but it’s always better to be prepared! But I was curious so I know how many times to multiply it? It would depend on the size of the container you will be putting it into. You will have a little more than a cup (8oz) of finished product so if you put it into 1oz containers you would have 8+ containers, if you use a larger container you would have fewer and so on, so it all depends on the amount you want to give in your gift basket. I hope that this helps. Personally make an ointment by mixing about 2/3 BFI powder with 1/3 generic Neosporin ointment. But would like to make some of this ointment also. I was thinking of making this and putting it into lip balm tubes, for easy application and can be carried with you in a purse, first aid kit etc, but not sure what to add to the recipe to make it solid enough to put into the tubes. Any suggestions? Thanks! I created a version of this and my friends and family love it and always asking me to make more!!! I am allergic to all citrus fruits, even on skin, what would be a good substitute for that? If you can handle small amounts of honey without reaction but react more when you eat more you may have a sensitivity not an allergy. Strangely enough, I use that mixture (minus the vitamin E oil) as a perfume! Not as much tea tree oil, though. Now I have another excuse to make a batch! I made my third batch last night. I infuse arnica, mullein, and chamomile into the oil and add a tbs of honey. It works so much better than petroleum based Neosporin! I didn’t see any credit given so I wanted to give you a heads up. Hello! Thank you for sharing this recipe. Just wondering how much product this recipe makes? We’ve been using this ointment for a couple of years on cuts and scrapes. Not long after we started using it we discovered that it works great on mosquito bites, especially if you get to them right away. Recently, I’ve discovered another really great use. Deodorant! I’ve tried every natural alternative to deodorant and nothing works, homemade or store bought. I’d about given up when I decided to try one last store bought variety. Disaster! I broke out in an awful rash. I pulled out my antiseptic ointment to treat the rash only to discover, NO body odor! I think I will use a bit more beeswax in my next batch to firm it up a bit and pour it into an old deodorant tube so I don’t have to apply it with my fingers any longer. It’s amazing! Thanks for such a great recipe. What about cornstarch in place of the beeswax? Would that work? I know cornstarch s good for a number of skin ailments such as diaper rash, burns, athletes foot and sunburn. It’s a really, really bad idea to make these medical claims for homemade products. This us NOT (not, not, not) some sort of natural ‘Neosporin’. First, Neosporin is a combination of three NATURAL antibiotics in a petroleum base. Antibiotics from the human perspective are toxins that hurt humans less than bacteria (which is rare). They do not include the compounds from the EOs – which are just toxic in general. Thankfully, they are pretty mild toxins, and nearly harmless at the dilutions you use. Honey is your best bet (almost full strength required) for anibacterial action. Use the REAL thing if you are concerned about an actual infection. I greatly appreciate the movement to get away from many synthetics and to simplify, but this is not the place to do it and put your kids at risk.